Data From Airport Facial Recognition Devices – Are There Safeguards In Place? Airport Facial Recognition Devices – what’s going on with the data? Did you know Airlines are collecting data using facial recognition? While the Customs and Border protection government agencies are using facial recognition technology at Airports, who is ultimately responsible for where that data goes, who collects it, and what it can or can’t be used for? 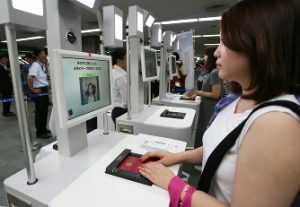 It turns out a few private companies including many of the major airlines are the organizations that are actually installing the devices that are scanning your face. That means they are the ones that are in possession of that data. Jonathan Frankle, PhD Candidate at MIT and a part of the Internet Policy Research Initiative (IPRI) was recently interviewed and quoted by the New York Times in an article exploring the issue. Frankle says it’s not inherently wrong for companies to do this or for the governmental agencies to contract private companies to do this. Wouldn’t it be nice to not have to worry about a boarding pass or driver’s license or passport while going through security or dropping off your luggage? But Frankle cautions that protecting that data and having safeguards, protections, and privacy policies in place should be of upmost importance. And from what we understand now many of these safeguards might not currently be in place and there isn’t a way to verify what is being done with this data and what kind of security and protections are in place.